Departing from a digital lifestyle can be easier than you think, and quality outside time can fit into even the busiest of schedules. The best way to do this is by example. When parents rediscover their sense of wonder, so do most kids. Children need to develop a relationship with nature first before they know how to love and care for it. 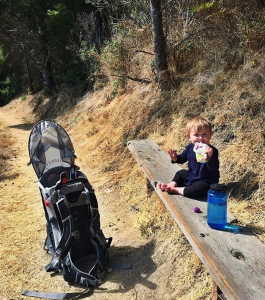 Parents- invest in a good all-terrain stroller or infant backpack carrier so together you can comfortably explore the outdoors. Binoculars and magnifying glasses can also add to the experience! But honestly, just carving out the time and heading to a park is all you need to enjoy what nature has to offer. 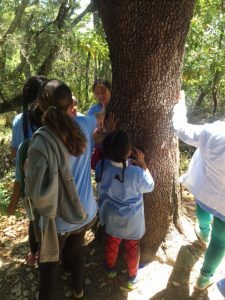 Teachers can take their class out into a park to write poetry about nature, measure redwood trees using a ballpoint pen or learn more about local history. To de-stress, have kids sit quietly in the shade of a tree and practice breathing techniques with their eyes closed. Use those senses! Ask your child to listen deeply- what sounds do they hear and where are they coming from? Take a deep breath- what do you smell? Look at a tree- how many different colors do you see? Go looking for nests, whether that be a squirrel, bird or woodrat’s nest. Can you tell what it is made of? Where is the nest located? Can you build a nest? What would you use? 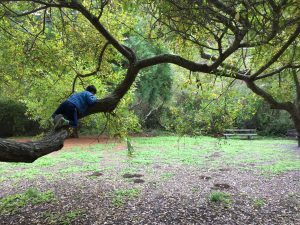 Set aside an hour of nature play time for kids every day. The American Academy of Pediatrics and the Centers for Disease Control agree an hour of free play and moderate activity daily is a prescription for lasting health. Identify the closest park to your home or kid’s school and make a point of visiting it. Plant native plants and hang birdfeeders in your backyard or on your porch to attract local wildlife, like bees and hummingbirds. Children can help water and then keep an eye out for who comes to visit. Create a scavenger hunt list for kids and include items like a flower petal, pinecone, colorful leaf, piece of litter, something fuzzy, square, bumpy, etc. Enhance this with a camera and make a collage of your found objects. Lay down by day and look for faces and shapes in the clouds; lay down by night and look for the milky way, shooting stars and constellations. Mark down special events like the Perseid and Geminid meteor showers. 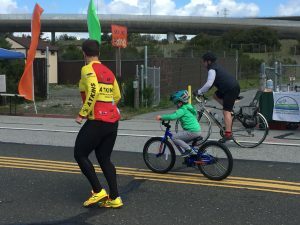 Dress appropriately and experience weather in a park- whether that be wind at Pillar Point Bluff, fog on San Bruno Mountain or a light rain in Memorial Park. Have fun navigating mud puddles! Collect twigs, leaves, feathers, flower petals, driftwood and create a piece of artwork on a large piece of paper. Or see what music you can make with nature’s tools. Take your kids out and learn basic navigation with a map and compass. Volunteer with San Mateo County Parks’ Stewardship Corps and plant native plants or weed out non-natives. 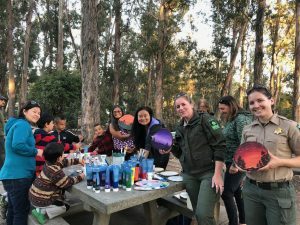 Attend San Mateo County Parks Foundation’s summer series, Coyote Nights, to toast s’mores and hang out in a park with friends as the day winds down. Parents can volunteer to chaperone field trips to nature areas and share in the experience. Parents can also help their kids plant food gardens at home. This physical activity can foster a lifelong appreciation of good nutrition and understanding of where our food comes from. Spending time in nature can help prevent and treat disease. Children do better physically and emotionally when they are in green-spaces. Free play outside leads to a lot of physical activity for kids and this is essential for healthy brain development. It also helps combat the negative trend of increased childhood obesity and diabetes. Children perform better in school when they have spent time in nature being active. Their bodies have to move in order for the wheels of their brains to turn. When children learn about science or history in a park setting, they are better able to pay attention and are more likely to remember what they learned. Engaging in outdoor creative play allows children to develop their executive function which can be a greater predictor of success in school than IQ. 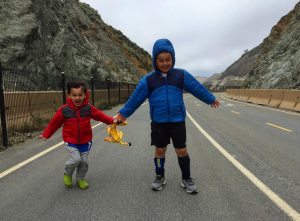 Freedom in the outdoors is liberating for kids. They gain confidence in themselves because they have the power to make independent decisions. Playing outside with friends teaches kids how to interact with peers and be less solitary. While more screen time has led to a rise of nearsightedness, being outside improves our eyesight. Exposure to sunlight is also good for our bones. Outdoor play nurtures the imagination and allows for problem-solving. Burning off excess energy outside leads to higher levels of fitness, calmer kids and a better night’s sleep. Being in nature is soothing and things take on a slower pace which helps with depression, anxiety and hyperactivity. Active kids grow up to be active adults and the health benefits follow!